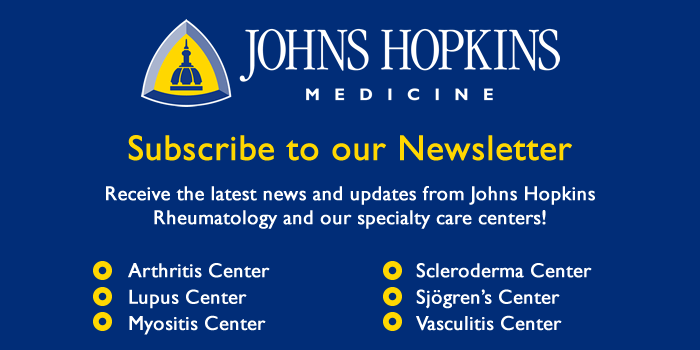 The Johns Hopkins Scleroderma Center specializes in the care of patients with scleroderma and related conditions such as Raynaud’s phenomenon, localized scleroderma, scleromyxedema, scleredema, and eosinophilic fasciitis, among others. The doctors are attending physicians and full time faculty members at The Johns Hopkins University School of Medicine. All are board-certified in rheumatology. The mission of The Johns Hopkins Scleroderma Center is to provide excellent clinical care while seeking to better understand the causes and best treatment approaches for scleroderma. All physicians at the Center are actively involved in clinical or translational research, looking for ways to transform discoveries in the laboratory into new and better treatments for patients with scleroderma. Other members of The Johns Hopkins Scleroderma Center supporting patient care and research efforts include a clinical nurse, research and patient care coordinators, and medical assistants. The Center is linked to other expert specialists at Johns Hopkins that help manage scleroderma related health problems. The team is dedicated to ensuring the highest quality, state-of-the-art health care for patients. The Johns Hopkins Scleroderma Center is one of the largest and most active in the world, seeing over 200 new patients each year.